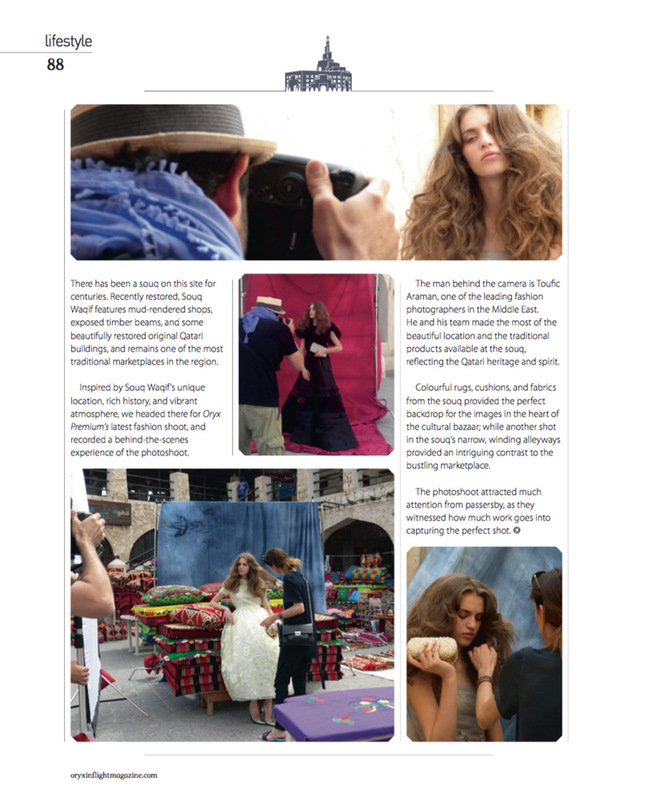 Inspired by Souq Waqif’s unique location, rich history, and vibrant atmosphere, we headed there for Oryx Premium’s latest fashion shoot, and recorded a behind-the-scenes experience of the photoshoot. The man behind the camera is Toufic Araman, one of the leading fashion photographers in Qatar and the Middle East. Toufic’s vast experience in fashion photography has made him one of the most sought after photographers of fashion designers and fashion magazines in the region. He and his team made the most of the beautiful location and the traditional products available at the souq, reflecting the Qatari heritage and spirit. The photoshoot attracted much attention from passersby, as they witnessed how much work goes into capturing the perfect shot. The production crew of the photography production agency, aramanstudio was able to transform the Colourful rugs, cushions, and fabrics from the souq as the perfect backdrop for the images in the heart of the cultural bazaar; while another shot in the souq’s narrow, winding alleyways provided an intriguing contrast to the bustling marketplace. Toufic Araman’s keen eye on details, creativity and expertise in fashion photography has been reflected in this shoot. 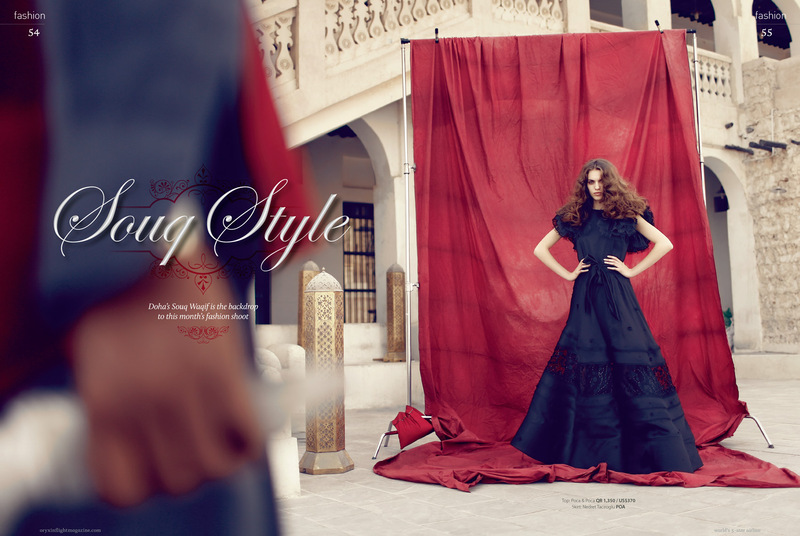 Capturing Qatar’s rich heritage through Souq Waqif and combining it with the modern twist through this fashion shoot. In record time, Souq Waqif Boutique Hotels (SWBH), the luxury, five-star hotel collection owned and managed by Al Rayyan Hospitality, has made its mark on the Qatari and regional tourism scene. With its gleaming, pristine hotels in the heart of historic Souq Waqif, the award-winning collection blends style and originality with modern design features while embracing Qatar’s heritage. SWBH now has eight exceptional five- star designer hotels in Souq Waqif: Al Mirqab, Arumaila, Al Najada, Al Jasra, Al Bidda, Musheireb Al Jomrok, and Bismillah, embodying the ultimate in panache and flair with their perfectly executed architectural design. Now guests can experience the bustle of the lively Souq Waqif market before enjoying a charming escape to one of the eight exclusive gems that make up the luxury boutique hotel collection, offering state-of-the-art facilities. With their own distinct character, each of the eight designer hotels provides its own individual style of Qatari hospitality. A seamless blend of authentic Arabic heritage and flawless contemporary elegance, the hotels all offer a luxurious retreat from the fascinating labyrinth of alleyways in Souq Waqif with their welcoming boutique shops and atmosphere from a bygone era.